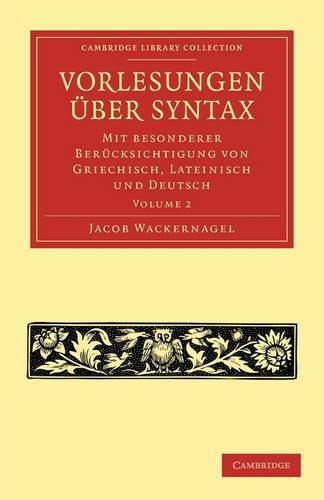 In 1920-1924 Jacob Wackernagel (1853-1938), Professor of Comparative Philology at the University of Basel, published two volumes of lectures on Greek, Latin and German syntax based on his 1918-1919 courses for beginning undergraduates (who would already have studied all three languages at school). Wackernagel introduces the principles of grammatical functions and cross-linguistic work, and provides a foundation for the understanding of comparative syntax. The book remained in print for many decades thanks to its lively style and well-chosen examples from classical texts. The Sanskritist Louis Renou (1896-1966), writing on Wackernagel in 1938, asserted that 'no linguist could possibly afford to ignore this book', and it remains of interest to historical linguists and scholars of classical languages today. In this, the second volume, Wackernagel discusses gender, nouns and adjectives, pronouns, the article, prepositions and negation.